Mollie Sleeping Bag- Over five feet long, this bag is stuffed with comfy polyester and is the perfect place for a night filled with sweet dreams. Enough room for 2 children and surface cleanable. 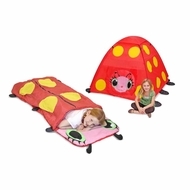 Mollie Tent- Mollie & Bollie invite your child into a Sunny Patch adventure in this easy-to-set-up tent. The perfect cozy space for hours of imaginative play awaits within! In 1989 The Melissa & Doug Company started in the garage of the home where Doug grew up! Thanks to your support, the Melissa & Doug Company grew and was able to move into a real office down the road. Their philosophy has remained the same over the years-to make each and every customer a happy and permanent member of the Melissa & Doug family, while offering products with tremendous value, quality and design. Melissa & Doug have always welcomed customer suggestions, and they continually strive to make improvements to their products. Melissa & Doug are honored by the faith you place in them and view it as their responsibility to continue to earn your trust in the years to come! Melissa and Doug range of products include puzzles, preschool, play food, puppets, stuffed animals and gardening toys. This is a great gift for any child for inside or out!